If you are looking for a new and uncomplicated breakfast option, give this banana Dutch baby pancake a try. 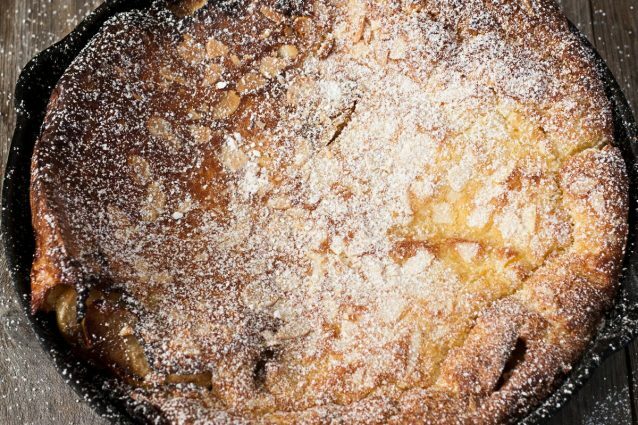 Dutch baby pancakes are much easier than making traditional pancakes as you do not have to spend the time frying each pancake. 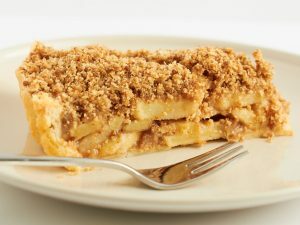 Simply mix the batter and pour it into a skillet and into the oven it goes, coming out about 15 minutes later perfectly browned and ready to eat. 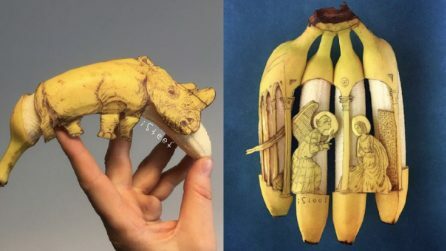 Here we add bananas to the pancake but feel free to use almost any fruit that you think may go well. 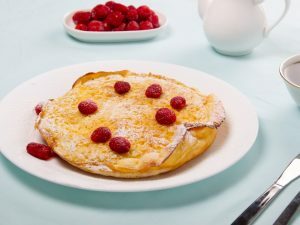 Dutch baby pancakes are also delicious plain, with no fruit, just add a touch of maple syrup or powdered sugar and you will love this new breakfast treat. Turn the oven on to 350 ̊F and in an oven safe skillet (make sure the handle of the skillet is not plastic that will melt in the oven!) or in an eight inch round cake pan, melt the butter along with the banana slices in the pan by placing it in the hot oven. Remove the pan from the oven once the butter has melted (the butter should melt in about 1 minute). Pour the smooth batter into the pan over the butter and bananas. Bake the pancake for about 15-20 minutes or until the edges are browned and begin to turn upward. Slice the pancake in the pan and serve with your desired topping. -This recipe can easily be cut in half to make a single serving pancake. Use a smaller pan, such as a 6 inch cake pan, if you cut the recipe in half. Poffertjes: the traditional Dutch mini pancakes you'll fall in love!